The weekend was a cracker - and quite unexpectedly. Saturday night, and a 60th birthday party ... there seem to be a lot of them at the moment. I don't mind, but as the years pass our parties become increasingly staid, and conversations tend to centre around ailments, aches, pains, divorces and money bleeding kids who just won't go away and leave their parents in peace. At least with the kids we can take our revenge by living long enough to be a burden on them ... ha! But this 60th birthday party was different. This was Geoff Robert's 60th. 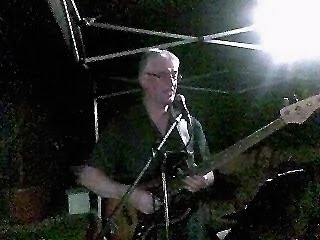 Way back in the early seventies Geoff had a band, and since retirement he has been able to dedicate more of his time to music - so to our surprise when we arrived at his house, we found a stage set up in the garden where his new band ripped through some great numbers. One of the partygoers was the lead guitarist from the original seventies band, and he stepped up for a guest spot. Music ranged from Standards, to Stones to Hendrix, and I noticed that some of the kids across the street were standing by open bedroom windows and a few hovering at the end of the drive. I think Geoff's band has been asked to play as 'American Anthems' and there will be a cd early next year. It's always great to hear live music, and Geoff's party made our minds up to go to more gigs in future. Of course, expecting the standard party I didn't take a camera, so I only have this picture taken on my (very cheap) phone. But it was a great gig Geoff - happy birthday! On Sunday morning we decided to have a quieter day at a local steam rally and country fair. Our nephew, Richard Hobbs would be there showing his 1966 Matchless motorcycle, inherited from his granddad, Miss W's father. And it was the usual sort of thing. Loads of traction engines, heavy horses in ploughing competitions, classic cars and so on. 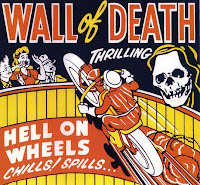 There was also a traditional fair, and amongst the steam driven gallopers (one of Miss W's favourite rides) old fashioned swing boats and candy floss was an attraction that I had previously only ever seen in comics and old american films - the Wall of Death. Probably the best £2 I've spent on a show in years. The audience stand around the top of what is basically a giant wooden barrel. 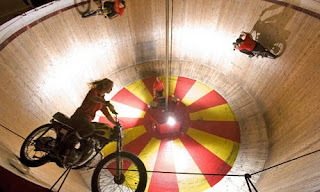 Some of the bikes are 1920s Indians - one used by a 'Tornado Smith' in a wall of death show back in the 1930's. The noise and the smell is awesome as the riders arc and wheel, sometimes riding from the bottom right to the top, within inches of the spectators. That's exciting enough, but when they do it with the throttle locked open as they sit on the handlebars or stand on the bike with their hands raised, well, just amazing really. The finale has three riders tearing round, just missing each other, until they finally form line abreast. We both agreed that this old, old sideshow remains a genuine thrill - god alone knows what the 'elf & safety people would make of it! 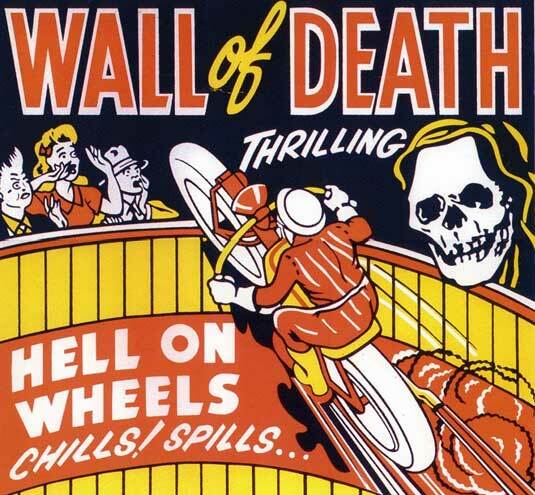 If you get a chance to see Ken Fox's Hell Riders - do. The day ended with a bit of nostalgia for Miss W as she joined Richard on the pillion of her dad's old Matchless for the display tour of the show ring, just as she did in the past when he used to take it to the shows. A great weekend. The solitude of the hills has its place, but we all need a little entertainment from time to time. Rock & roll & fast bikes? Yeah, why not!